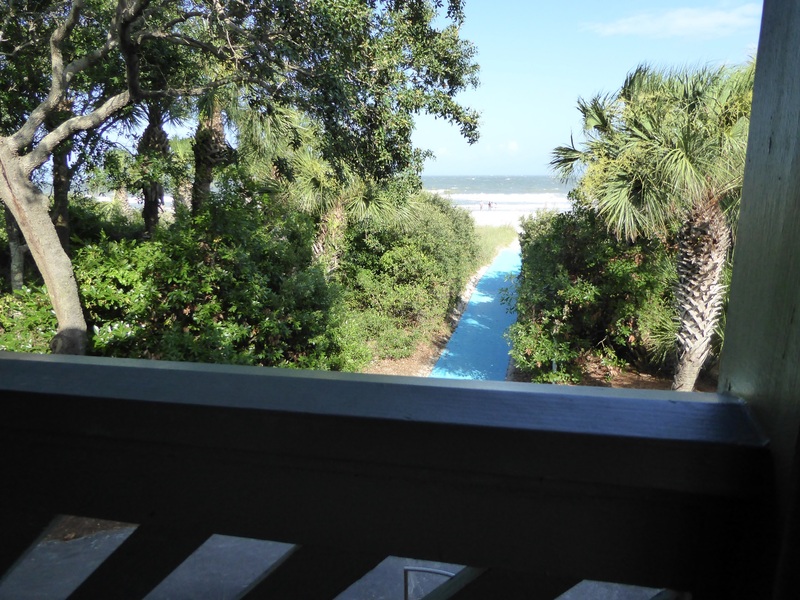 Guest Blogger: Michelle K’s Disney’s Hilton Head Island Resort – Why You Want to Visit! Want a vacation so good that you contemplate picking up everything to move there? 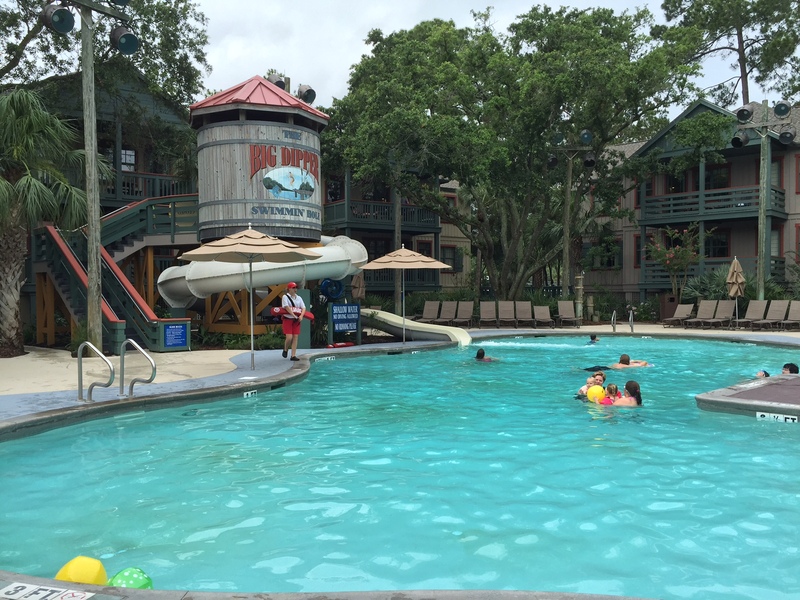 We had the chance to spend a night at the Disney’s Hilton Head Island Resort and that is exactly what we found! Wondering if this destination is right for you? 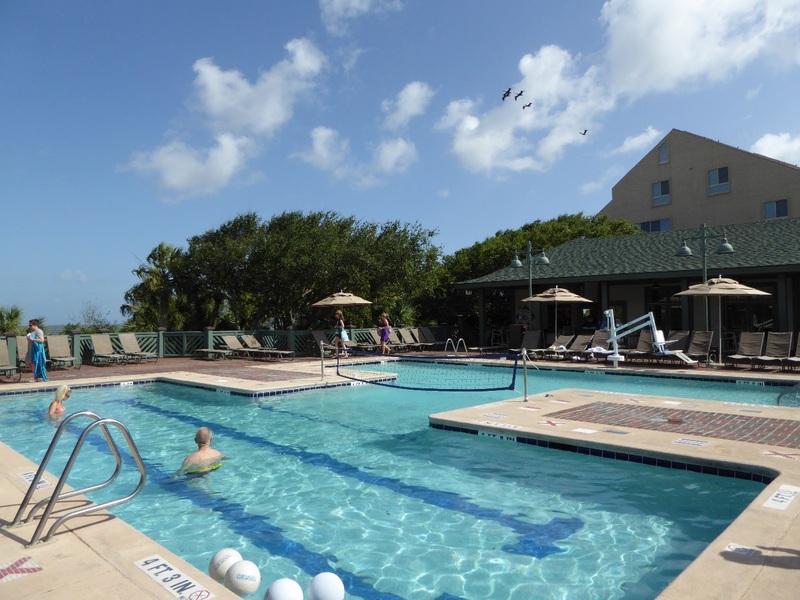 We’re sharing our trip report; let’s dive into the fun and amenities this resort has to offer. 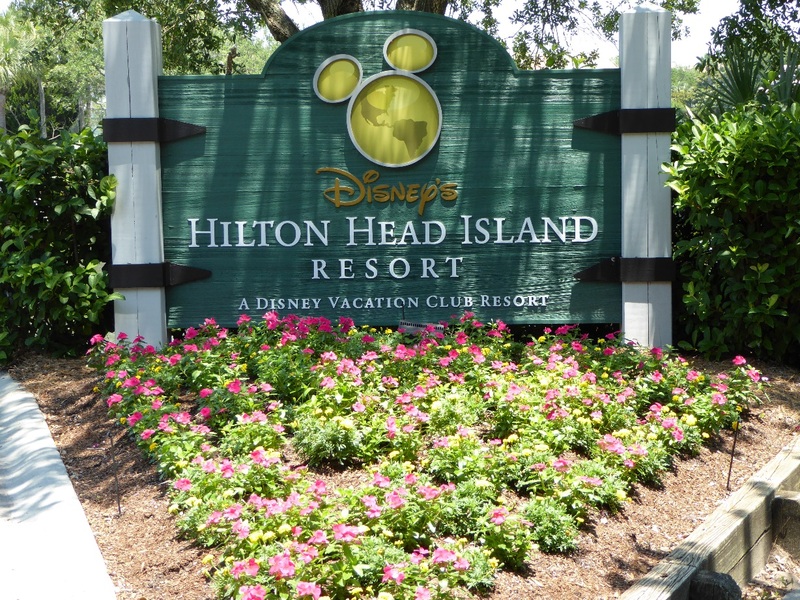 We had added a one night stay at Disney’s Hilton Head Resort at the end of a vacation on the island. Because we only had one day to try everything out, we arrived bright and early at the resort at 9 am to make the most of our time. Check-in was a breeze and the room was ready even though we were there so early; talk about Disney magic!! As the room was ready, we dropped off of our things off before jumping into the resort activities. Curious about the rooms? We were too! We had booked a studio and were pleasantly surprised at how well laid out the room was. The room had a small kitchenette which was separated from the main room. For sleeping arrangements, the room had a queen bed comfortable enough to turn us all into Sleeping Beauties and a double sized sleeper sofa. The real knockout of the room was the view from the patio. Both the scenery and rocking chairs on the patio provide a serene oasis, perfect for vacation R&R! After dropping off luggage, it was time to sign up for activities and hit the pool! The resort offers several activities, many that change daily. These offer something for everyone: nature lovers, those seeking relaxation, kids, and adults alike. 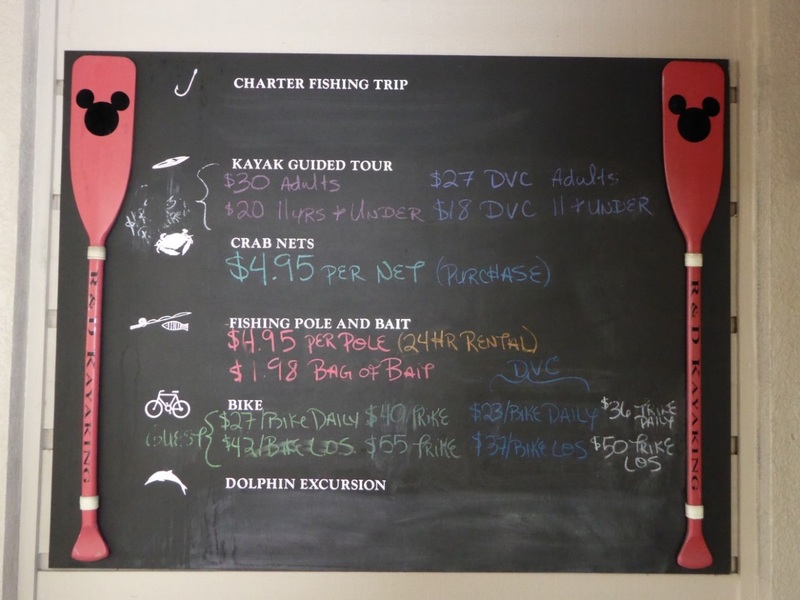 Activities include guided kayaking, bike rentals, golf lessons, wildlife classes, fishing, crafts, and nightly s’mores making, just to name a few. The water slide at the pool is similar to slides at other Disney resorts and they have Disney trained life guards (bonus – this is great as Disney takes safety very seriously!) In addition to the pool, the swimming area also has a kiddie pool for the young ones and a hot tub. 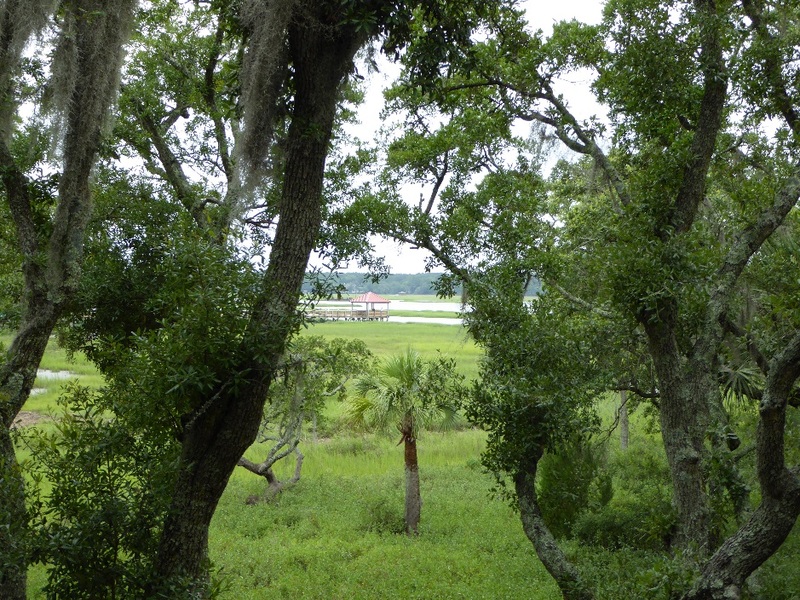 Next up, the marsh tour! 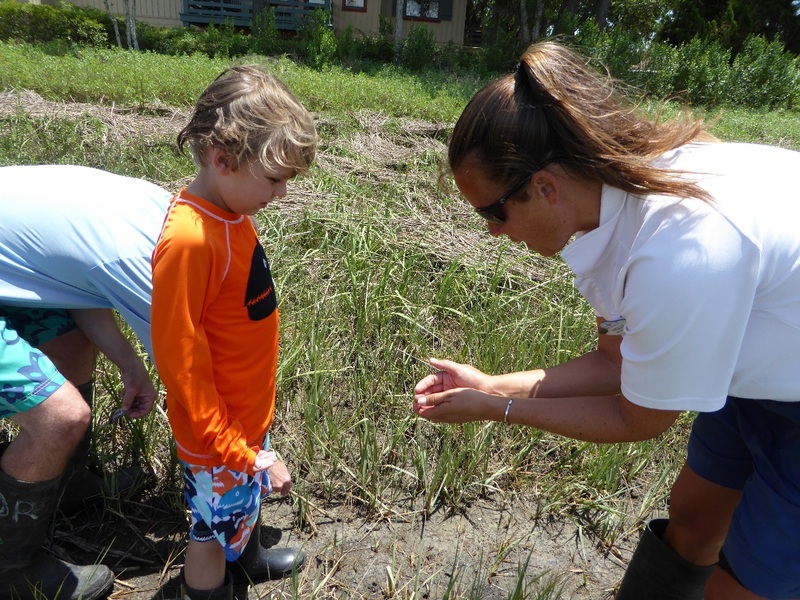 We checked in, put on boots provided by the Activities Center, and headed out into the salt water marsh with the Disney nature guide. The tour was the perfect length at less than an hour. 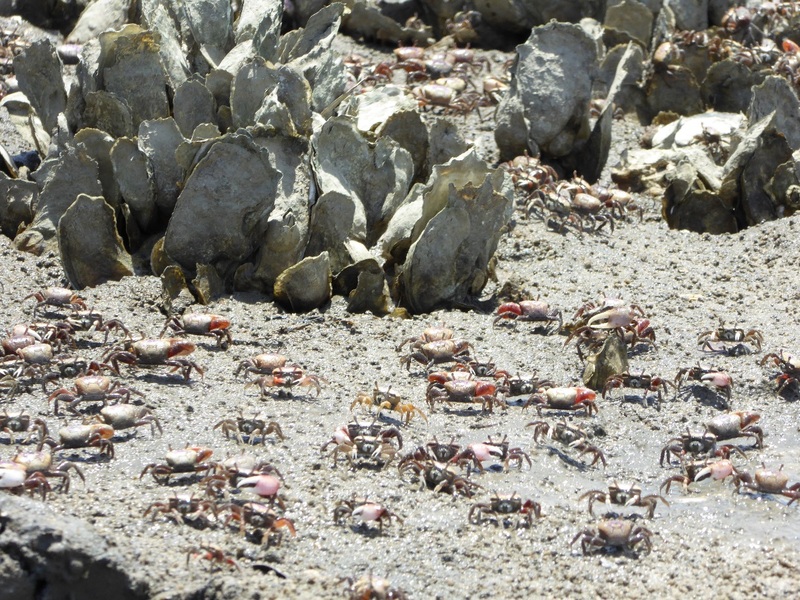 We enjoyed learning about plants and viewing thousands of crabs. It was a great mix of edutainment and hands-on learning! The tour wrapped up in time to join in the Mickey tie-die activity. We could make paw print or Mickey shirts – of course you know what we chose – Mickey!! After finishing the shirts, it was time for pool games! 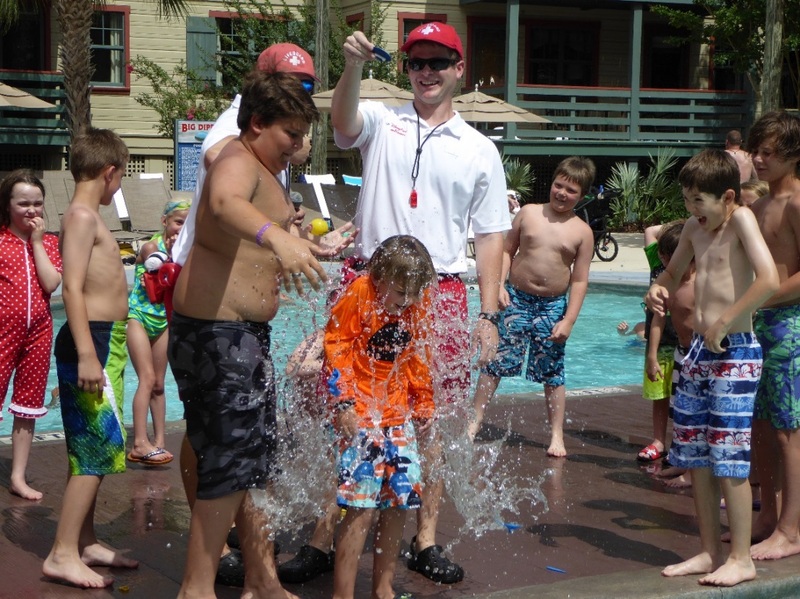 The games were held at the pool and led by lifegaurds; these cast members brought so much energy and fun to the games. This activity rocked and had the kids laughing from preschool to middle school age! Games included ice water relays, hula hoop contests, and hot potato with water balloons. Guess what happens when you get caught with the hot potato?! After pool games and a few more trips down the water slide, we were on a mission to Signals, a seasonal restaurant at the Disney Beach House. Why the importance? DOLE WHIPS! Yes, this Disney Theme Parks treat is available at the resort! 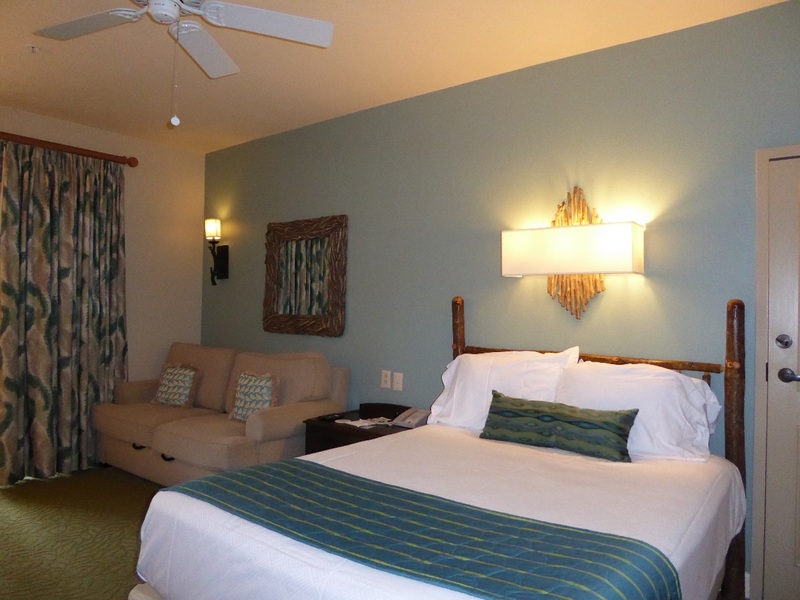 The Disney Beach House is located in the Palmetto Dunes resort; shuttles run between the main Disney resort and Beach House throughout the day and parking is also available. The Beach House is amazing and makes the perfect home base for a day at the shore! Amenities include a pool with volleyball net (water volleyball for a hot day anyone? 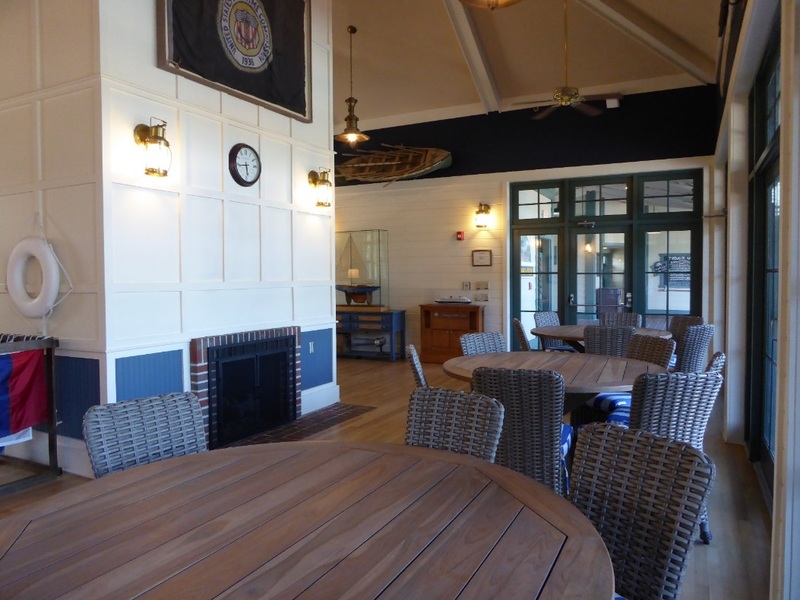 ), splash pad area, game tables (including pool, ping pong and foosball), a beautiful indoor area (complete with game tables, flat screen TV, couches, and fireplace), Surfman’s Sand Bar for tropical drinks and snacks, and the counter service restaurant Signals. Disney is committed to providing great experiences for all guests, including guests with mobility disabilities. 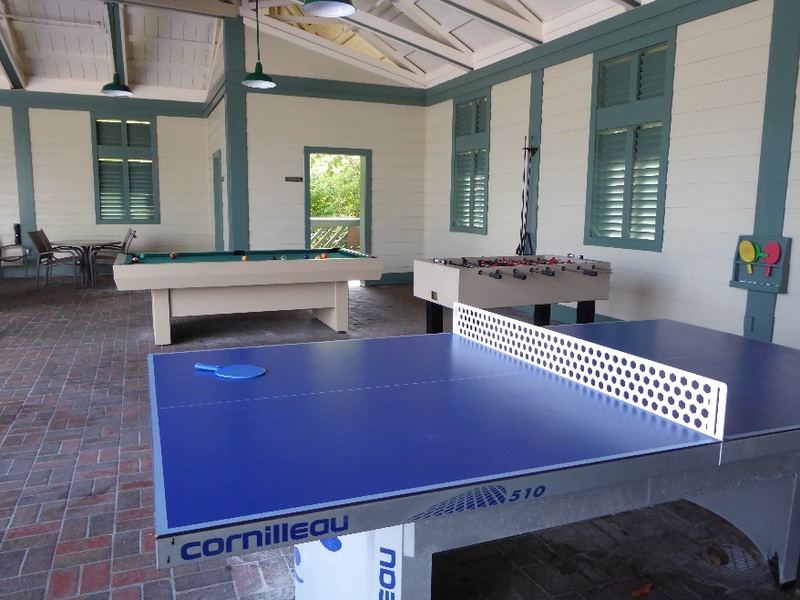 The Disney Beach House had two amenities that were great to see. The first was a wheelchair designed for sand (make sure to check with the Front Desk if you need one as there are limited quantities). The second amenity was one we had never seen before; it was a flat, matted pathway to make walking and wheeling to the beach easier. Having traveled with a family member in a wheelchair, this is such a game changer to making the beach a possibility! After an early dinner, we headed back to the resort to play shuffle board and hit the water slide a few more times. Did we mention how fun the pool was?! 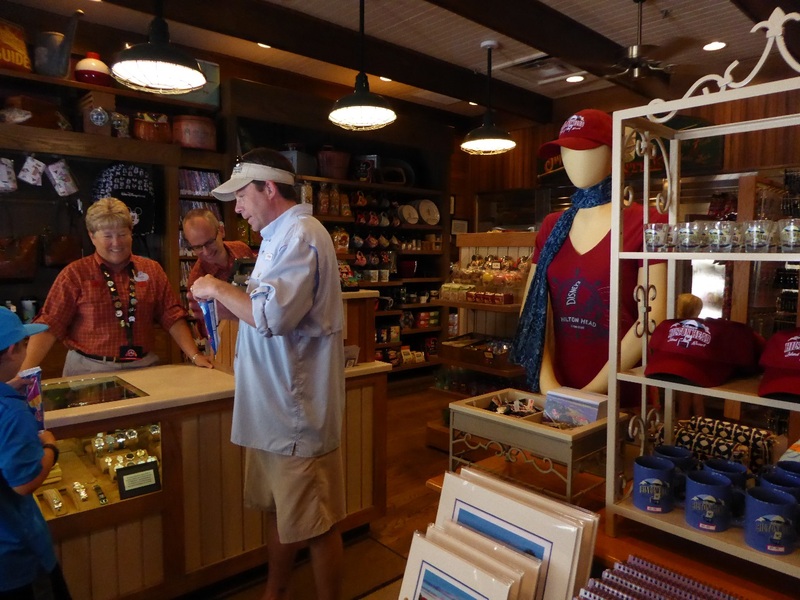 Next up was the Broad Creek Mercantile store at the resort. Here you can find sundries, snacks, and super cute Disney souvenirs; make sure to check it out! We picked up some of our favorite Disney treats including Mickey Ice Cream Bars and Disney Main Street caramel corn for movie night. The Mercantile had every Disney movie we had ever heard of available for free check out. The movies were a great mix of films, with choices for everyone ranging from documentaries to animated films. We finally settled on Brother Bear, a film none of us had seen, and finished up the evening with movie night. The next morning it was Mickey waffles for everyone at Tide Me Over, the resort counter service restaurant. Tide Me Over serves meals throughout the day and can also provide carry out service, just in case you need to get back to one of the hammocks scattered through the resort! Last stop was back to the Broad Creek Mercantile for a little pin trading before checking out. Disney’s Hilton Head Resort was different from what we had expected, but actually better than what we had envisioned. The Disney customer service level was even more top-notch than what we have experienced in the parks, maybe we can call it Pixie Dust Plus! I would recommend the resort as a fantastic home base for just about any type of traveler or group. It is sure to not disappoint for laid back R&R trips, family vacations, and group trips. The only negative from our trip was having to leave so quickly! Below are things to consider and a few tips if you decide to check out the magic! Kid’s Night In and Teen’s Night In – Two great options for the kids to have their own fun while the grownups get their own time to check out Hilton Head Island. Everyone is a winner with this one! Pin Trading – Make sure to bring your Disney pins! Pin trading is available at the Activities Center, Front Desk, Broad Creek Mercantile, and with other guests. Grab a Dole Whip – Signals closed at 5 the day we were there; plan accordingly! Activities – With so many daily activities to choose from, check out the resort guide for a complete listing help plan your stay. Groceries – Stop by one of the grocery stores on the island to get supplies if you plan to do any cooking. Broad Creek Mercantile has a small groceries section to tide you over if you aren’t able to make it to the grocery store on the first day or two. Vacation Planning – Use an authorized Disney vacation planner if you are not a Disney Vacation Club member. Tara McClure, one of the Dole Whipped ladies, made planning the trip a breeze. Disney vacation planners are compensated by Disney and are a great resource in planning the best possible trip for you! Have concrete plans the day after you get home that can’t be changed; this will keep thoughts of never coming back home to a minimum. Just kidding here! However, you will probably have such a great time that coming back is definitely in the future! 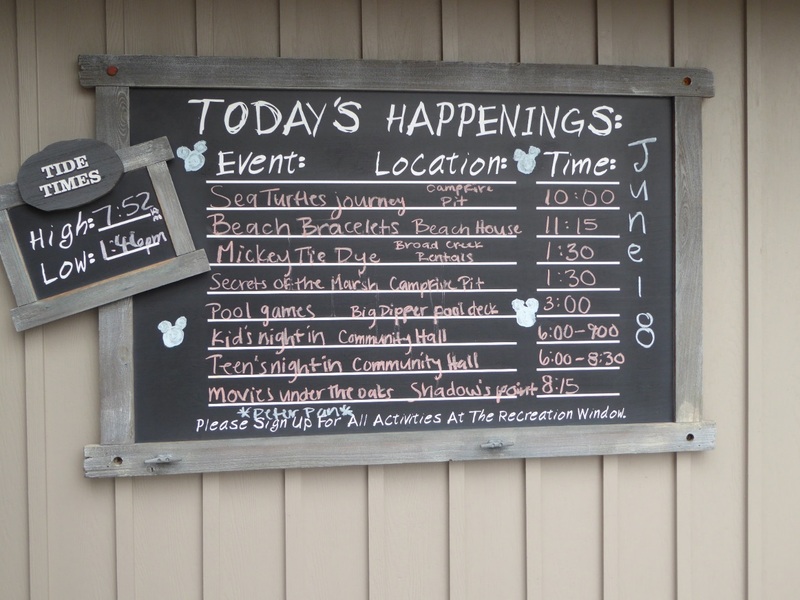 This entry was posted in Resorts, Trip Reports and tagged Disney's Hilton Head Island Resort, DVC, hilton head, Mickey Bars by Tara. Bookmark the permalink.